The Health and Wellness Committee of the Crestview Area Chamber of Commerce would like to invite you to our 12th Annual Health & Wellness Expo 2019 at the Crestview Community Center located on Commerce Drive, next to Bob Sikes Library. We plan to include over 80 vendors (on a first come, first serve basis) who can offer a variety of healthcare screenings, services, education and information. We will be advertising and promoting the event through local television, radio, and newspapers. Tables with partitions will be provided and each booth will be 8 x 10 feet in size. 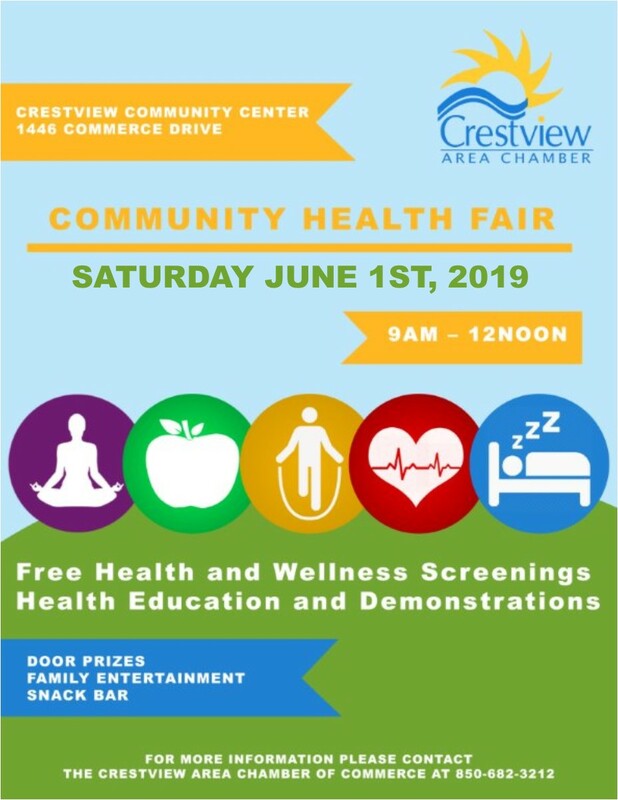 The Crestview Chamber Health & Wellness Expo will be held at the Crestview Community Center on June 1, 2019. This event is for people of all ages (members and non members) to build awareness for the many health related organizations available in Crestview. Various health care screenings, services, and information will be available, free of charge. We hope you will join us for this 11th Annual event!